It was only a few months ago I wrote about my Sony MDR-100ABN noise cancelling headphones which have been absolutely perfect for listening to music in my home office. The MDR-100ABN was squarely placed for use indoors at home, and I mentioned that I also had two additional sets of earphones that I regularly use with my phone – wired and wireless. I was very disappointed that my wired earphones broke soon after publishing that article. It was my sixth pair of Nokia WH-920 in-ear headphones I’d had, and they were less than 6 months old. My experiences with the MDR-100ABN made me think that a s set of in-ear headphones in the same Sony range would be a good idea. I would see if I could replace both my wired and wireless headphones with a single set which I could use in all other situations. 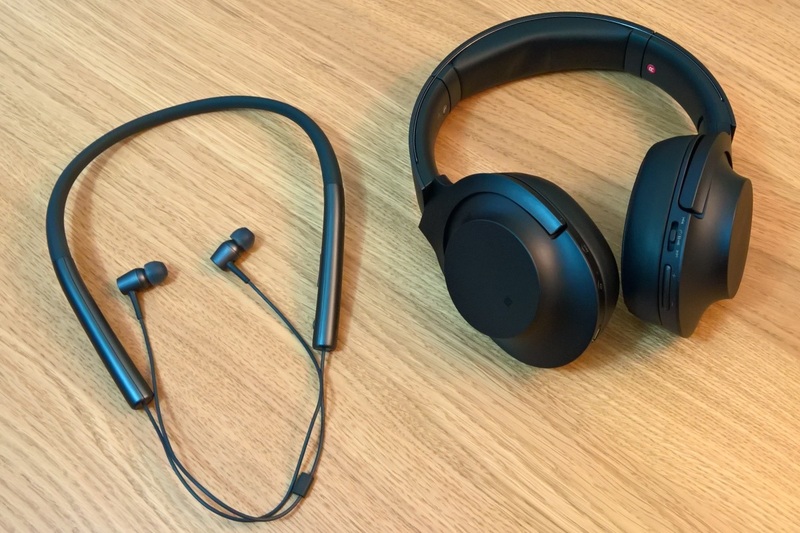 When looking into my options for over-ear headphones I had looked through Sony’s whole line of h.ear headphones, with particular attention to the Bluetooth offerings. The MDR-EX750BT looked like the best fit for outdoor use, but like last time I took the same qualities into consideration before making the purchase. I know a lot of people are not keen on the in-ear style headphones, but I’ve been using them for many years. It’s only recently that I started using over-ear headphones at all. As expected the earbuds fit well and I have had no discomfort from them – even when using them to listen to music for 12 hours worth of travel. The main electronics of the headphones go behind-the-neck. 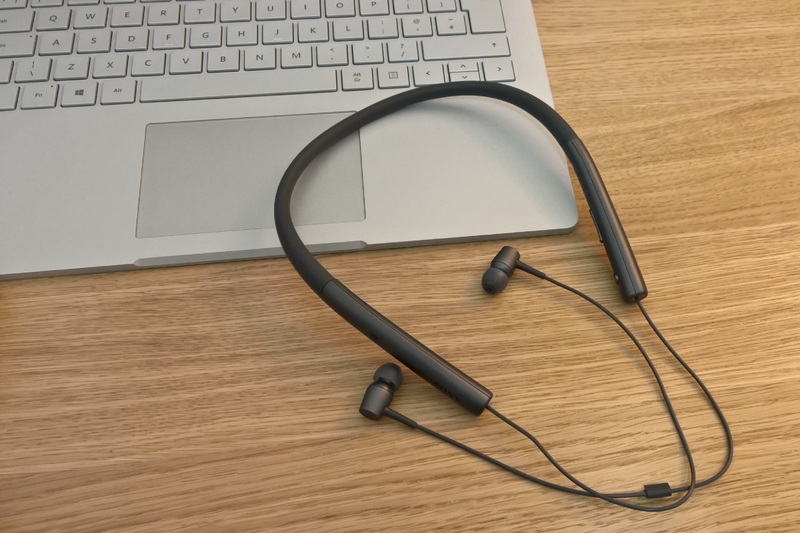 I have previously found this to be a good option for Bluetooth headsets and until battery technology improves I don’t think there is any better alternative. The main electronics are not heavy, and you hardly notice that it is behind your neck. The exception would be if you are running, but I wouldn’t recommend using this style of earphone for running anyway. This time I wanted a smaller device that I could keep with me every day and use while I am at work, walking around or using public transport. It’s always a gamble when it comes to battery life for these kinds of devices and like with the MDR-100ABN I have been pleasantly surprised at how long they work. I’ve easily gone for a full day out with it wirelessly connected to my Lumia 950 XL – using it for music for a good proportion of that time. Unfortunately the MDR-EX750BT also don’t support Bluetooth multipoint. Ideally I’ve love to be able to seamlessly be able to switch audio from my Lumia and Surface without having to go through the effort of pairing again. Maybe next time. For times when I don’t want to use the battery, I can use a provided Micro USB #x2192; 3.5mm Audio cable. I think I would have preferred a standard audio cable, but everything works as you’d expect so I am not going to complain too loudly. Bluetooth connectivity is fast becoming a must-have for my headphones and the biggest factor is the freedom that it affords. Knowing I can walk to another room without having to unplug cables is really liberating. An additional freedom is offered hear by easily keeping them on at all times and just plugging in when required. They hang from your neck and provide easy access while the phone is either in my pocket or on a desk. Audio quality is always something I want, but for me it’s a “I’ll know it when I hear it” kind of deal – and in this case, I know that it sounds good. Some of the Bluetooth headphones I have used in the past sound obviously compressed, but I can’t tell much difference between this headset and wired headphones. I would have loved to have had the same active noise cancellation technology I have enjoyed on the MDR-100ABN, but I have yet to find some behind-the-neck style Bluetooth headphones that have it. It’s not a problem though, as the in-ear style headphones isolate external sound by design. The in-ear style is also better for isolating sound leaking out of the headphones. Unlike my over-ear headphones I use at home, I use these in-ear headphones out in public and in quiet environments like offices. For now I have consolidated on two sets of headphones, both are wireless but support wired as backups. Both meet my requirements in different ways, and both work great with my Surface and Lumia.